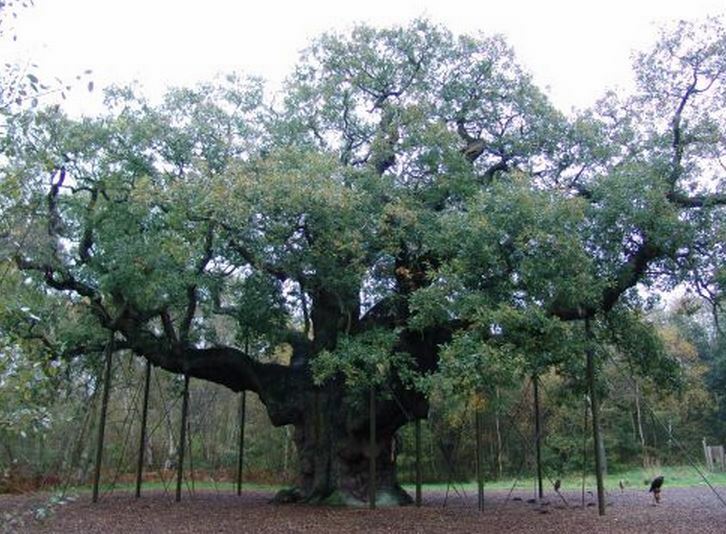 The largest surviving oak tree in Sherwood Forest is the Major Oak, estimated to be 1,000 years old; the oldest is thought to be the Parliament Oak. The now lost Shambles Oak was a latterday “Robin Hood’s” secret larder! The Shambles Oak, was killed when picnickers lit a fire beside it in 1913 and it blew down in 1920. 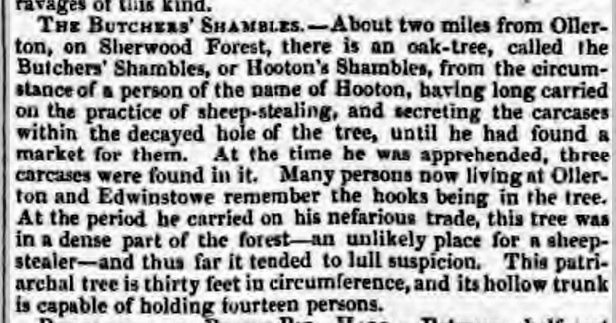 A story in the Derby Mercury of 4th June 1851 tells of a sheep-stealer named “Hooton”, who used the tree, which was thirty feet around, to hide the carcasses of his ill-gotten gains. People living in 1851 remembered his beam and hooks being in the tree, suggesting the hiding place, deep in the forest, was in use in the 17th or 18th century. Perhaps the culprit was one Samuell Hooton of Ollerton, who was christened on the 4th May 1633? Whilst the newspaper report of 1851 says the trunk could contain fourteen people, the Nottinghamshire Guardian of 27th May 1864 tells us that “recently twelve persons from Nottingham” stood inside the trunk to sing the anthem, “Great and Marvellous are Thy Works”. Let Woods for the Trees find your family stories in old British newspapers. And read other blog posts here.